I officially declare this weekend 'The Weekend of the Drizzle'. Not just because it rained on the Queen's Diamond Jubilee Pageant today, but because my weekend cooking has been covered with it. Friday saw my Diamond Jubilee Lemon, Blueberry and Raspberry Bundt, drizzled in red, white and blue lemon icing. Yesterday, mushrooms drizzled on sourdough toast (tenuous!). 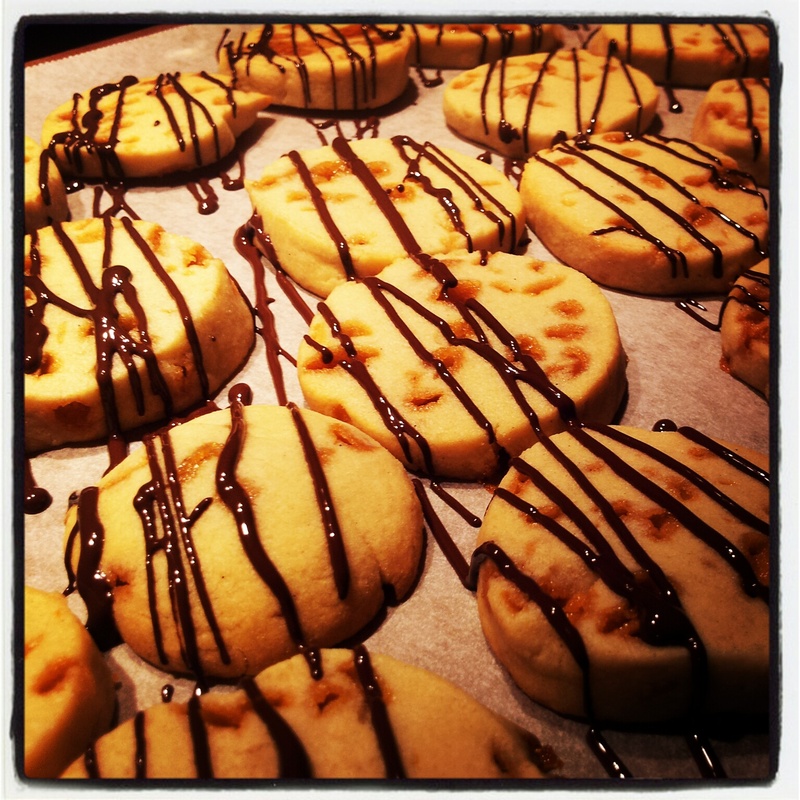 Today, it was the honeycomb shortbread rounds' turn to get drizzled in chocolate. Tomorrow, it will hopefully be miniature pavlovas, drizzled with spiced rhubarb compote. From Tuesday, I must return to the diet. Tomorrow we're off on a surprise visit to my Grandad's cousin. It's her birthday on Tuesday and she's a huge fan of my biscuits and truffles, so I had the ideal opportunity to try something new for her as a gift. Her favourites are shortbread, so I decided to give them a little twist. Normally, I'm a woman of simple tastes and like my shortbread plain or with chocolate chunks in. But in-keeping with the blog, I found myself a recipe for honeycomb shortbread. It's a typical shortbread recipe with a ratio of 2 parts flour to one part sugar and one part butter. The key thing here though is to use really good quality ingredients. It must be butter for biscuits - no margerine. And vanilla bean paste makes all the difference compared to extract. In such a simple biscuit, there's no hiding behind inferior ingredients. The better ingredients you can afford, the better it will taste. It's not always the way with cake, but you will definitely notice the quality ingredients in a biscuit. You can substitute a fifth of the flour for cornflour to make them shorter or ground rice to make them a little crunchier. And then you just stir in 50g of honeycomb pieces. I cheated and used ready-bought from Sainsburys but Nigella has a fabulous recipe if you want to eat some (and rot your teeth in the process). Finally, for a bit of showiness, I drizzled them with melted, plain chocolate. In the morning, they'll be put into a gift bag and delivered to Auntie Pam. I don't expect them to last more than a day! Beat the butter and sugar until light and fluffy. Mix in the egg and vanilla bean paste until well combined. Mix in the flours and salt until it forms a soft dough. Divide into two and shape into logs, around 4cm in diameter. Wrap tightly in cling film and refrigerate for at least two hours. Preheat the oven to 180c/160c fan/350 fan. Line two baking trays with baking parchment. Remove the biscuit logs from the fridge and cut into rounds about 8mm thick. Place on the baking sheets, spaced apart to give them room to spread. Bake for 10-12 minutes. Cool the biscuits on the trays for 10 minutes then move carefully to a cooling rack until completely cold. Keep the parchment lined baking sheets. When the biscuits are cold, gently melt the chocolate in a bowl placed over some simmering water (don't let the water touch the bottom of the bowl). Pour into the corner of a ziploc bag, snip off a tiny piece of the corner and drizzle the chocolate over the biscuits. Leave until the chocolate is set then package. Thanks for the Honeycomb Shortbread Rounds recipe. If you don't mind, can you submit your Honeycomb Shortbread Rounds photo in http://www.foodporn.net ? It's a food photography site full of all DIY food pictures from members around the world. Or perhaps you'd like to submit by yourself? Let me know when you did, so I can share it.